This was dinner tonight, and the smell of this soup takes me back to summer and the fresh sweet corn that we love so much. It is a heart-warming and healthy bowl…one that my husband says he could eat every night. This recipe makes a good bit, and the leftovers are equally satisfying. For a crowd, the recipe can easily be doubled. I typically simmer it on the stove top, but my sister-in-law likes to make this soup in her slow cooker. Heat olive oil in a large, heavy-bottomed soup pot or Dutch oven. Saute onion, celery, and carrots until onion is translucent, about 5 minutes. Add bay leaves, saffron, stock, water, and chicken. Bring to a boil, then reduce heat and simmer for 20-30 minutes. Remove chicken to cool slightly. Add both corns and noodles and continue to cook soup at barely a simmer. In about fifteen minutes, shred chicken, and return to pot. Continue cooking for another half hour to an hour. Remove bay leaves, and add eggs, parsley, sugar, and salt and pepper to taste during the last 10 minutes. Yummy! Made this last Sunday and it is wonderful! The leftovers are all gone! I am so glad you enjoyed, leftovers and all! I speak a little Spanish but haven’t gotten to the level of adding my posts in Spanish, too! Maybe someday! 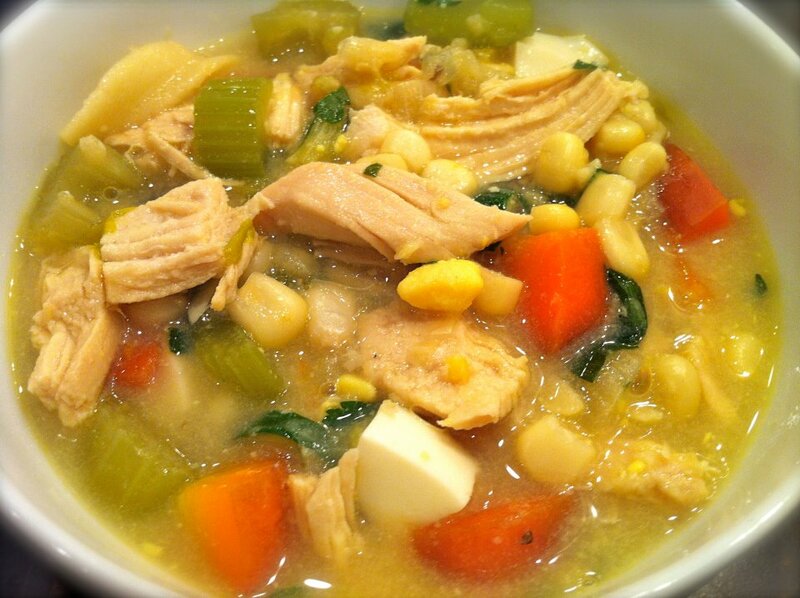 I prefer from scratch made from a whole chicken and fresh corn but it’s a great quicker version. Use at least a 6 quart pot as it makes about 5 quarts. The first thing I noticed it was too sweet. Sweet corn is adequate where you don’t need sugar. The other change I would make is hold off on the noodles until the last 10-15 minutes. The way it is they are over cooked and dissolving. Growing up in Amish country I know saffron is a key ingredient but I couldn’t justify the $17.50 Walmart charges for a little bottle so I added a little basil instead. The other tweak I done was add a small can of mushrooms. Overall a pleasing and satisfying meal. I will make it again. Hi Ron, Thank you for your thoughtful feedback and suggestions. I’m delighted you enjoyed the soup and made some adjustments to suit your preferences. And I agree on ther saffron–it can be expensive and can certainly be omitted! Hi Shirley, I’m from Pennsylvania Dutch country and this soup is a staple here, hence the name. I’m thrilled it was a success, and it was so thoughtful of you to share! Just made this soup on a very, very cold Thursday in Pennsylvania. It was absolutely delicious and hit the spot!! It has been very, very cold, Cheryl. I’m delighted this hit the spot and appreciate your feedback!